This blog post will demonstrate how you can show or hide all comments quickly in Microsoft Excel 2016. 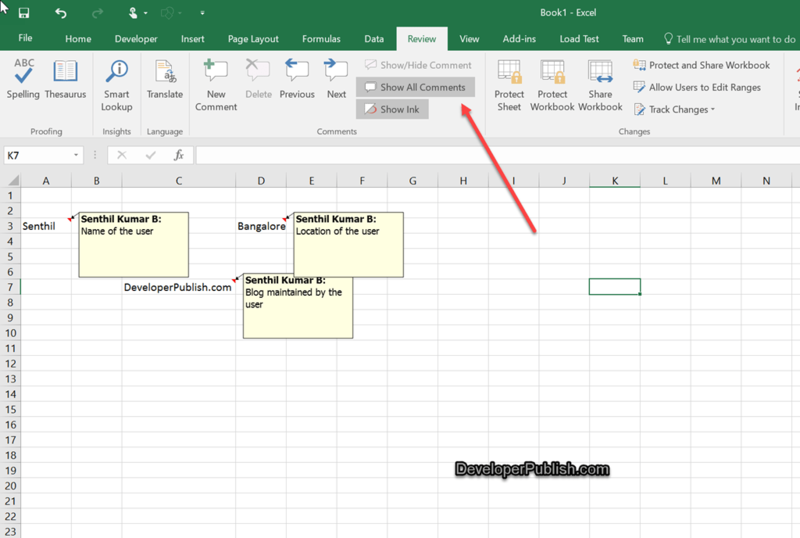 When we add few comments in excel sheet , you tend to see a little red colored triangle in the top right border of the cell indicating that there is a comment and when we mouse hover on the indicator , the comment box will be displayed showing the comment. There are times when you might want to quickly view all the comments that are entered in the worksheet. Navigate to the Review Tab in the Excel Ribbon and select the Toggle button “Show All Comments”. This would display all the comments in the excel sheet. To hide all the comments click the same “Show All Comments” button again.